Please read these Terms of Service ("Terms", "Terms of Service") carefully before using the https://gamemak.in website (the "Service") operated by Gamemakin LLC ("us", "we", or "our"). Intellectual Property The Service and its original content, features and functionality are and will remain the exclusive property of Gamemakin LLC and its licensors. The Service is protected by copyright, trademark, and other laws of both the United States and foreign countries. Our trademarks and trade dress may not be used in connection with any product or service without the prior written consent of Gamemakin LLC. Our Service may contain links to third party web sites or services that are not owned or controlled by Gamemakin LLC. Gamemakin LLC has no control over, and assumes no responsibility for the content, privacy policies, or practices of any third party web sites or services. We do not warrant the offerings of any of these entities/individuals or their websites. You acknowledge and agree that Gamemakin LLC shall not be responsible or liable, directly or indirectly, for any damage or loss caused or alleged to be caused by or in connection with use of or reliance on any such content, goods or services available on or through any such third party web sites or services. You agree to defend, indemnify and hold harmless Gamemakin LLC and its licensee and licensors, and their employees, contractors, agents, officers and directors, from and against any and all claims, damages, obligations, losses, liabilities, costs or debt, and expenses (including but not limited to attorney's fees), resulting from or arising out of a) your use and access of the Service, by you or any person using your account and password, or b) a breach of these Terms. In no event shall Gamemakin LLC, nor its directors, employees, partners, agents, suppliers, or affiliates, be liable for any indirect, incidental, special, consequential or punitive damages, including without limitation, loss of profits, data, use, goodwill, or other intangible losses, resulting from (i) your access to or use of or inability to access or use the Service; (ii) any conduct or content of any third party on the Service; (iii) any content obtained from the Service; and (iv) unauthorized access, use or alteration of your transmissions or content, whether based on warranty, contract, tort (including negligence) or any other legal theory, whether or not we have been informed of the possibility of such damage, and even if a remedy set forth herein is found to have failed of its essential purpose. Gamemakin LLC its subsidiaries, affiliates, and its licensors do not warrant that a) the Service will function uninterrupted, secure or available at any particular time or location; b) any errors or defects will be corrected; c) the Service is free of viruses or other harmful components; or d) the results of using the Service will meet your requirements. Website under construction. Why are you here? If its Unreal Engine 4 related, we can do it. Having trouble going from game design to implementation? Can't wrap your head around developing your virtual reality experience? Gameplay mechanic implementation is what we do best. Interested in bending Unreal Engine 4 to your own needs? Whether its turning UE4 into a beautiful 4k kiosk installation or allowing a professional driver to race around while wearing an Oculus Rift, we got you covered. In addition to our services, we also sell things! Arbitrary Actors flown straight to you! Stay up to date with our services and products! Whether it is a business inquiry or just to say hi, send us an email! 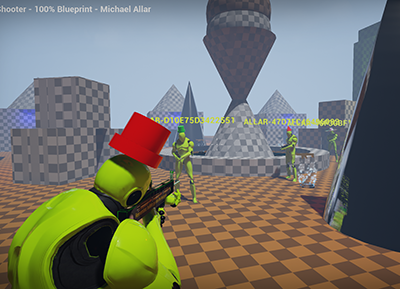 Generic Shooter is a 100% Blueprint project that serves as a great starting point for creating a first or third person shooter in Unreal Engine 4. 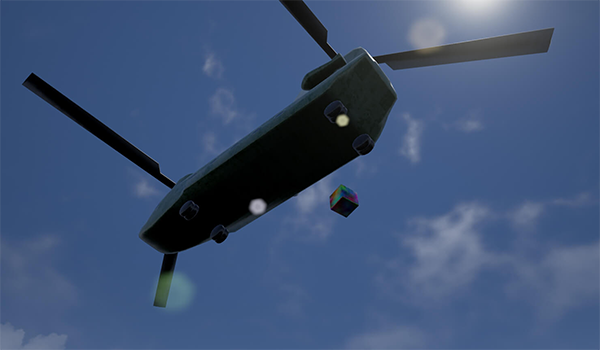 It is currently for sell on the Unreal Engine marketplace. 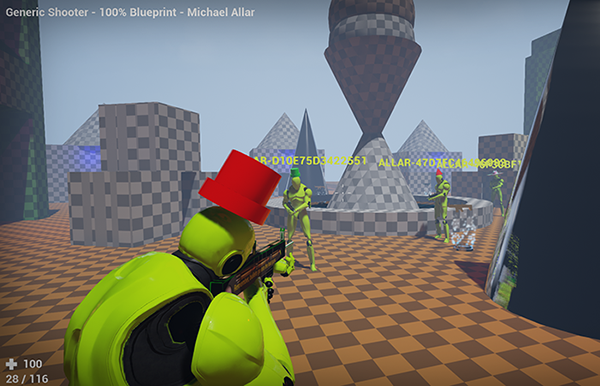 With over 1300 units sold, Generic Shooter is one of the best selling assets on the Unreal Engine 4 marketplace. 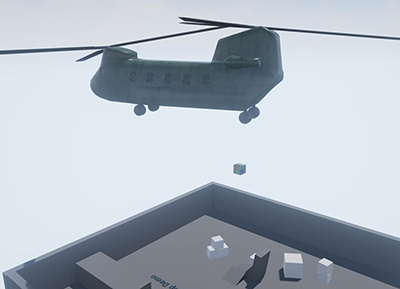 Generic Air Drop is a simple blueprint demonstrating how to drop an arbitrary actor in a manner similar to a Call of Duty ‘Care Package’. You can buy it on the Unreal Engine 4 Marketplace.